user warning: Table './active5_foxes/cache_filter' is marked as crashed and should be repaired query: SELECT data, created, headers, expire, serialized FROM cache_filter WHERE cid = '2:8853ff5235bdb9ddc9e5bc348aa056ff' in /home/active5/public_html/drupal6_multisite/includes/cache.inc on line 25.
user warning: Table './active5_foxes/cache_filter' is marked as crashed and should be repaired query: UPDATE cache_filter SET data = '<p class=\"rtecenter\" style=\"\">\n	<img alt=\"\" src=\"http://www.catchingfoxes.com/sites/www.catchingfoxes.com/files/resize/blog/Cow%20Milking%20with%20words-486x351.jpg\" style=\"width: 486px; height: 351px; border-width: 5px; border-style: solid; margin: 10px; \" title=\"\" width=\"486\" height=\"351\" /></p>\n<p>We planned our summer vacation for this moment. &nbsp;2,623 miles. &nbsp;And I couldn&#39;t watch.</p>\n<p>He took a job out west working as a wrangler on a ranch this summer. 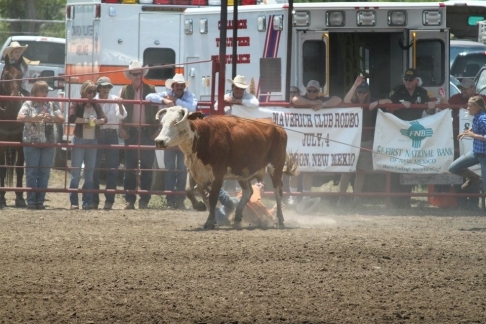 The town&#39;s July 4th rodeo gave all the wranglers the opportunity to be cowboys.</p>\n<p>He told me early June he was entering two events: Wild Cow Milking and Wild Horse Racing.</p>\n<p>Wild Cow Milking was first.</p>\n<p>His job was to chase down a roped cow and hold her still so a team member could milk her.</p>\n<p>He had run and caught her three times, been tossed over her head, pressed under her weight, and dragged.</p>\n<p class=\"rtecenter\" style=\"\"><img alt=\"\" src=\"http://www.catchingfoxes.com/sites/www.catchingfoxes.com/files/resize/blog/Cow%20Milking%204-486x324.jpg\" style=\"width: 486px; height: 324px; border-width: 5px; border-style: solid; margin: 10px; \" title=\"\" width=\"486\" height=\"324\" /></p>\n<p class=\"rtecenter\" style=\"\"><img alt=\"\" src=\"http://www.catchingfoxes.com/sites/www.catchingfoxes.com/files/resize/blog/cow%20Milking%209-486x324.jpg\" style=\"width: 486px; height: 324px; border-width: 5px; border-style: solid; margin: 10px; \" title=\"\" width=\"486\" height=\"324\" /><img alt=\"\" src=\"http://www.catchingfoxes.com/sites/www.catchingfoxes.com/files/resize/blog/Cow%20Milking%2012-486x324.jpg\" style=\"width: 486px; height: 324px; border-width: 5px; border-style: solid; margin: 10px; \" title=\"\" width=\"486\" height=\"324\" /></p>\n<p>And he got up and went after that cow again.</p>\n<p class=\"rtecenter\" style=\"\"><img alt=\"\" src=\"http://www.catchingfoxes.com/sites/www.catchingfoxes.com/files/resize/blog/Cow%20Milking%2014-486x324.jpg\" style=\"width: 486px; height: 324px; border-width: 5px; border-style: solid; margin: 10px; \" title=\"\" width=\"486\" height=\"324\" /></p>\n<p class=\"rtecenter\" style=\"\"><img alt=\"\" src=\"http://www.catchingfoxes.com/sites/www.catchingfoxes.com/files/resize/blog/Cow%20Milking%2018-486x324.jpg\" style=\"width: 486px; height: 324px; border-width: 5px; border-style: solid; margin: 10px; \" title=\"\" width=\"486\" height=\"324\" /></p>\n<p class=\"rteleft\">In the end, he was too exhausted to hold her. &nbsp;She fell on him, the two tangled in the rope. &nbsp;I walked out of the arena. &nbsp;My son lying still in the dirt.&nbsp;</p>\n<p class=\"rtecenter\" style=\"\"><img alt=\"\" src=\"http://www.catchingfoxes.com/sites/www.catchingfoxes.com/files/resize/blog/Cow%20Milking%2022-486x324.jpg\" style=\"width: 486px; height: 324px; border-width: 5px; border-style: solid; margin: 10px; \" title=\"\" width=\"486\" height=\"324\" /></p>\n<p class=\"rtecenter\" style=\"\"><img alt=\"\" src=\"http://www.catchingfoxes.com/sites/www.catchingfoxes.com/files/resize/blog/Cow%20Milking%2027-486x324.jpg\" style=\"width: 486px; height: 324px; border-width: 5px; border-style: solid; margin: 10px; \" title=\"\" width=\"486\" height=\"324\" /></p>\n<p class=\"rteleft\">I had been praying about this day for weeks. &nbsp;I didn&#39;t slept the night before. I confess as a woman, I don&#39;t understand the urge for adventure that young men feel. Rather, I fear. When the boys want to do something even slightly dangerous, I replay multiple scerenos over and over in my mind always with a tragic ending. 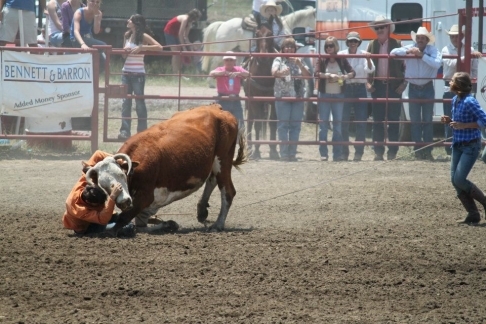 When they sign up to do something really dangerous, I get physically sick.</p>\n<p class=\"rteleft\">The morning of the rodeo, when I had exhausted my own resources to force my son to pull out, I pleaded, &quot;Lord, if he&#39;s not ready to do these events, somehow stop it.&quot;&nbsp;</p>\n<p class=\"rteleft\">He lived through the Wild Cow Milking. &nbsp;Rope burned hands, a bit winded, a sore ankle. Thirty minutes after the event, I saw him. He smiled big under his cowboy hat. 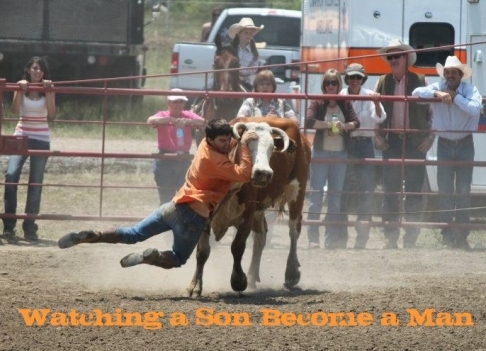 He had accomplished his goal to be in a rodeo. &nbsp;He had given it all he had.</p>\n<p class=\"rteleft\">There are some parts of raising sons that I will never grasp. Smiling after a five minute encounter with a 2,000 lb wild cow is one of them. &nbsp;But I do understand the mom&#39;s heart.</p>\n<p class=\"rteleft\">The tug between seeing my sons as little boys &nbsp;to be protected and letting them become men is continual. And so is the wrestle with God. Does He love my sons? &nbsp;Will He protect them when the circumstances are beyond my control? When I have to turn my back and not watch? I heard a loud yes to those questions at the rodeo. Wild Horse Racing was cancelled.&nbsp;</p>\n', created = 1555819952, expire = 1555906352, headers = '', serialized = 0 WHERE cid = '2:8853ff5235bdb9ddc9e5bc348aa056ff' in /home/active5/public_html/drupal6_multisite/includes/cache.inc on line 108.
user warning: Table './active5_foxes/cache_filter' is marked as crashed and should be repaired query: UPDATE cache_filter SET data = '<p class=\"rtecenter\" style=\"\"><a href=\"http://www.facebook.com/CatchingFoxes\" target=\"_blank\"><img alt=\"\" src=\"/sites/www.catchingfoxes.com/files/resize/social/facebook-64x64.png\" style=\"text-align: center; width: 64px; height: 64px; \" width=\"64\" height=\"64\" /></a><a href=\"http://pinterest.com/kimmrankin/\" target=\"_blank\"><img alt=\"\" src=\"/sites/www.catchingfoxes.com/files/resize/social/big-p-button-64x64.png\" style=\"width: 64px; height: 64px; \" width=\"64\" height=\"64\" /></a><a href=\"mailto:kim@catchingfoxes.com\" target=\"_blank\"><img alt=\"\" src=\"/sites/www.catchingfoxes.com/files/resize/social/mail-64x64.png\" style=\"width: 64px; height: 64px; \" width=\"64\" height=\"64\" /></a><a href=\"http://www.catchingfoxes.com/rss.xml\" target=\"_blank\"><img alt=\"\" src=\"/sites/www.catchingfoxes.com/files/resize/social/rss-64x64.png\" style=\"width: 64px; height: 64px; \" width=\"64\" height=\"64\" /></a></p>\n', created = 1555819952, expire = 1555906352, headers = '', serialized = 0 WHERE cid = '2:48be9f28bc948ea32b70445d0a590c98' in /home/active5/public_html/drupal6_multisite/includes/cache.inc on line 108.
user warning: Table './active5_foxes/cache_filter' is marked as crashed and should be repaired query: UPDATE cache_filter SET data = '<div class=\"fb-like\" data-font=\"verdana\" data-href=\"http://www.facebook.com/CatchingFoxes\" data-send=\"false\" data-show-faces=\"true\" data-width=\"280\">\n	&nbsp;</div>\n', created = 1555819952, expire = 1555906352, headers = '', serialized = 0 WHERE cid = '2:854065b9b61ff8596c8fa62e384317c7' in /home/active5/public_html/drupal6_multisite/includes/cache.inc on line 108.
user warning: Table './active5_foxes/cache_filter' is marked as crashed and should be repaired query: UPDATE cache_filter SET data = '<p><strong>Catch for us the foxes, the little foxes that ruin the vineyards, our vineyards that are in bloom. </strong><br /><em>Song of Solomon 2:15 NIV</em></p>\n<p>Metaphorically, the &quot;foxes&quot; are the damaging attitudes and actions that can creep in and threaten the love relationship of a couple and a home. &nbsp;Catching Foxes is committed to being a resource as you guard against the things that might injure and destroy the harvest you are striving to grow in your home.</p>\n', created = 1555819952, expire = 1555906352, headers = '', serialized = 0 WHERE cid = '2:132a8457abcc78748ef29251eaa8f1d7' in /home/active5/public_html/drupal6_multisite/includes/cache.inc on line 108.
user warning: Table './active5_foxes/cache_filter' is marked as crashed and should be repaired query: UPDATE cache_filter SET data = '<p><a href=\"mailto:kim@catchingfoxes.com\">kim@catchingfoxes.com</a></p>\n', created = 1555819952, expire = 1555906352, headers = '', serialized = 0 WHERE cid = '2:fe7b2055d10a2c25c439ca4710d86502' in /home/active5/public_html/drupal6_multisite/includes/cache.inc on line 108. We planned our summer vacation for this moment. 2,623 miles. And I couldn't watch. He took a job out west working as a wrangler on a ranch this summer. 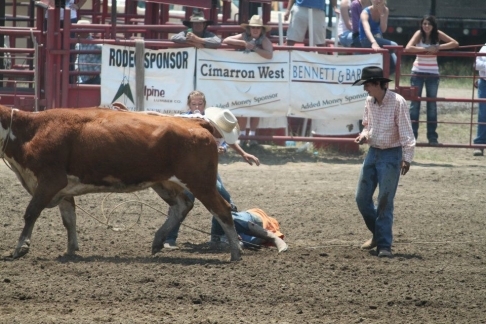 The town's July 4th rodeo gave all the wranglers the opportunity to be cowboys. He told me early June he was entering two events: Wild Cow Milking and Wild Horse Racing. Wild Cow Milking was first. 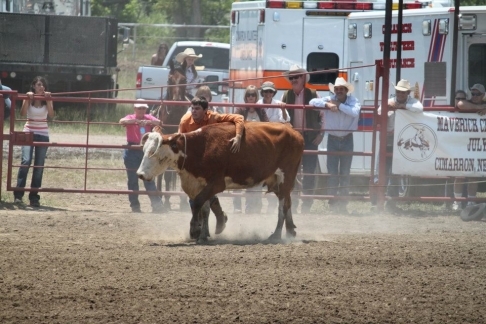 His job was to chase down a roped cow and hold her still so a team member could milk her. He had run and caught her three times, been tossed over her head, pressed under her weight, and dragged. And he got up and went after that cow again. In the end, he was too exhausted to hold her. She fell on him, the two tangled in the rope. I walked out of the arena. My son lying still in the dirt. I had been praying about this day for weeks. I didn't slept the night before. I confess as a woman, I don't understand the urge for adventure that young men feel. Rather, I fear. When the boys want to do something even slightly dangerous, I replay multiple scerenos over and over in my mind always with a tragic ending. When they sign up to do something really dangerous, I get physically sick. 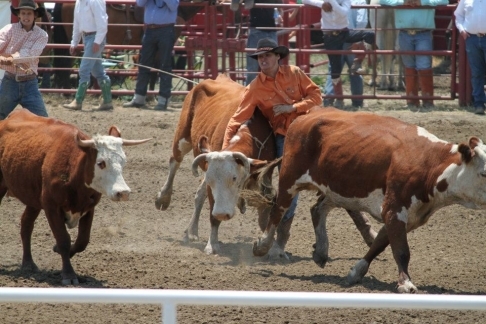 The morning of the rodeo, when I had exhausted my own resources to force my son to pull out, I pleaded, "Lord, if he's not ready to do these events, somehow stop it." He lived through the Wild Cow Milking. Rope burned hands, a bit winded, a sore ankle. Thirty minutes after the event, I saw him. He smiled big under his cowboy hat. 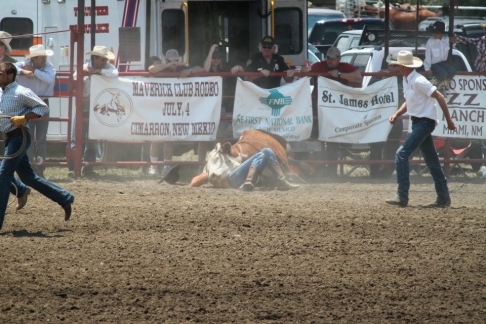 He had accomplished his goal to be in a rodeo. He had given it all he had. There are some parts of raising sons that I will never grasp. Smiling after a five minute encounter with a 2,000 lb wild cow is one of them. But I do understand the mom's heart. The tug between seeing my sons as little boys to be protected and letting them become men is continual. And so is the wrestle with God. Does He love my sons? Will He protect them when the circumstances are beyond my control? When I have to turn my back and not watch? 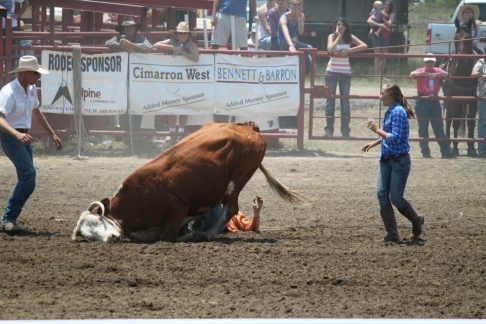 I heard a loud yes to those questions at the rodeo. Wild Horse Racing was cancelled.